Location Мадарски конник | Imprint.BG - the only producer and operator of the popular souvenir machines for Bulgaria. 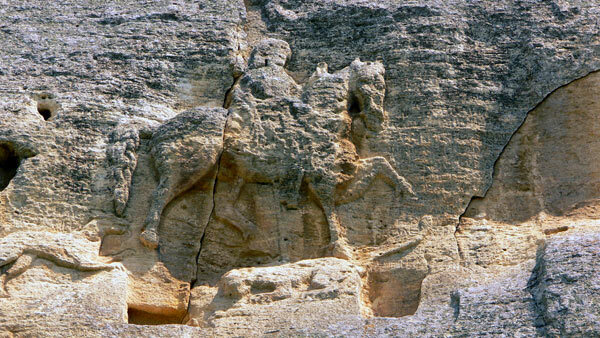 The Madara Rider or Madara Horseman is an early medieval large rock relief carved on the Madara Plateau east of Shumen in northeastern Bulgaria, near the village ofMadara. The monument is dated to about 710 AD and has been on the UNESCO World Heritage List since 1979. The relief depicts a majestic horseman 23 m (75 ft) above ground level in an almost vertical 100 m (328 ft)-high cliff. The horseman, facing right, is thrusting a spear into a lion lying at his horse's feet. An eagle is flying in front of the horseman and a dog is running after him. The scene symbolically depicts a military triumph. The monument was created during the rule of the Bulgar Khan Tervel, and is probably a portrayal of the khan himself. Other theories connect the relief with the ancient Thracians, claiming it portrays a Thracian god.